WARNING - For General Ventilating Use Only. Do Not Use to Exhaust Hazardous or Explosive Materials and Vapors. All electrical connections to this fan must be made in an approved type junction box. This junction box must be permanently attached to the fan at the point where the motor wires exit the metal duct pipe. The junction box must be reliably mounted to prevent it from shifting or rotating. The junction box can be attached with 2 or more sheet metal screws, rivets or machine screws with a nut and lock washer. Power to the fan must be supplied following all applicable building and electrical codes. Before Servicing Or Cleaning Unit, Switch Power Off At Service Panel And Lock Service Panel To Prevent Power From Being Switched On Accidentally. When The Service Disconnecting Means Cannot Be Locked, Securely Fasten A Prominent Warning Device, Such As A Tag To The Service Panel. Suncourt® Inc. does not provide electrical connection information. Due to the power of a booster fan, adequate protective measures must be taken to avoid contact with the impeller blades. In-Line Duct FansTM are designed to boost only dry (ambient) heated or cooled airflow in ducts of forced air systems with temperatures between 40°F (4°C) and 140°F (60°C). Suncourt Inc. accepts no responsibility for use of this product in other applications. Installation work and electrical wiring must be done by qualified person(s) in accordance with all applicable codes and standards, including fire-rated construction. Your In-Line Duct FanTM must be connected to a 110/120 Volt AC, 60Hz fuse or circuit breaker protected power source only in a manner approved by all applicable codes. Never connect your In-Line Duct FanTM to a 240 Volt AC blower motor or other 240 Volt system. All electrical connections to this fan must be made in an approved junction box. This junction box must be permanently attached to the fan at the point where the motor wires exit the metal duct pipe. The junction box must be reliably mounted to prevent it from shifting or rotating. The junction box can be attached with 2 or more sheet metal screws, rivets or machine screws with a nut and lock washer. Power to the fan must be supplied following all applicable building and electrical codes. The ground wire (GREEN) must be terminated at the furnace or other suitable ground. The power source must be protected by a fuse or circuit breaker rated at a minimum of 15 amperes. You may also supply power to your In-Line Duct FanTM using the Suncourt DuctStat® Temperature Sensitive SwitchTM or a standard on/off switch (Purchased Separately). Operating range is 40°F (4°C) to 140°F (60°C). Exposure to temperatures outside this range voids the warranty. For maximum performance and minimum noise, the best location to install your In-Line Duct FanTM is 6 - 10 feet from the register that needs the boost. To prevent air leaks use a good quality duct tape to seal seams in the ductwork after installing the In-Line Duct FanTM. By utilizing tapered reducers you may install larger diameter duct fans in smaller diameter ducts. Always leave your In-Line Duct FanTM accessible for maintenance, cleaning or repair. The In-Line Duct FansTM can be speed controlled using a Suncourt solid state speed control (Purchased Separately). Please visit www.suncourt.com anytime or during business hours you may phone 1-800-999-3267 for information regarding the appropriate speed control for your In-Line Duct FanTM model. NEVER USE A RHEOSTAT TO CONTROL FAN SPEED. 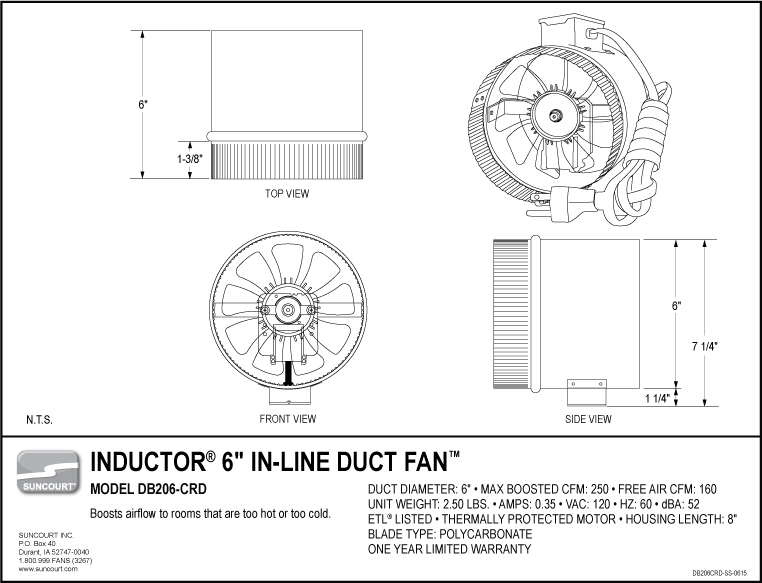 In-Line Duct FansTM with electrical box attached have the model number extension DBxxx-E.
In-Line Duct FansTM with a power cord attached have the model number extension DBxxx-CRD. 1. Locate the place in the duct where you wish to install the In-Line Duct FanTM. 3. Place the Inductor® In-Line Duct FanTM in the opening, making sure that the fan blade can turn freely. Align the arrow on the unit in the direction of airflow. 4b. Secure the In-Line Duct FanTM in position with the supplied #6 sheet metal screws using the provided holes in the base plate of the unit. label on unit in direction of airflow. 2a. Simply cut the flexible duct and slide the In-Line Duct FanTM in place by slipping the cut flexible duct ends over the crimped ends on the In-Line Duct FanTM, making sure the unit is well supported. Complete the installation by securing the In-Line Duct FanTM to the flexible duct with a good quality aluminum foil duct tape or nylon cable ties. 2b. Remove a section of the existing ductwork and slide the In-Line Duct FanTM in place by slipping the duct ends over the crimped ends of the unit. Complete the installation by securing the In-Line Duct FanTM to the metal duct with the supplied #6 sheet metal screws spaced evenly around the circumference on each end of the unit. 1. Locate the place in the duct where you wish to install the In-Line Duct FanTM. Align arrow label on unit in the direction of the airflow. 2a. Install connectors onto any uncrimped ends of the unit. Then simply cut the flexible duct and slide the In-Line Duct FanTM in place by slipping the cut flexible duct ends over the connectors or crimped ends on the In-Line Duct FanTM, making sure the unit is well supported. Complete the installation by securing the In-Line Duct FanTM to the flexible duct with a good quality aluminum foil duct tape or nylon cable ties. 2b. Install connectors onto any uncrimped ends of the unit, or crimp your existing ductwork. Then simply place the existing duct over the crimped ends of the unit, or the existing crimped ductwork into the unit. Secure the In-Line Duct FanTM to the metal duct with the supplied #6 sheet metal screws spaced evenly around the circumference on each end of the unit. The motor of your In-Line Duct FanTM may have 1 White and 1 Black wire or 2 Black wires. If you have a motor with a White and Black wire, connect the White motor wire to the White supply wire and the Black motor wire to the Black supply wire. If you have a motor with 2 black wires, connect either of the Black wires to the White supply wire and the other Black wire to the Black supply wire. Make sure you connect the colored wire as shown in the table below. Failure to connect correctly will destroy the motor. No warranty claim for an incorrectly wired motor will be accepted by Suncourt. DB306: Never connect yellow and red wires together! DB308 and DB310: Never connect red and black wires together! Suncourt® Inc. recommends that you clean your In-Line Duct FanTM at regular intervals, similar to what is recommended for the fan of your furnace, no less than twice a year. Keep your In-Line Duct FanTM free of lint, dust, and debris. The In-Line Duct FanTM must never be exposed to temperatures over 140°F (60°C). Subject to the following limitations, Suncourt® Inc. (manufacturer) warrants that the In-Line Duct FanTM will, for 1 (one) year from date of original retail purchase, but not exceeding 2 (two) years from date of manufacture, remain free from appearance of defects in workmanship or materials. This warranty is subject to the following limitations: (a) manufacturer’s liability is limited to the replacement or repair of the unit, as decided by the manufacturer; (b) a defective unit must be returned, prepaid, with proof of purchase, well packaged to avoid damage in transit; and (c) this warranty does not apply to defects resulting from the alteration, abuse, accidental damage, unauthorized repair, or misuse of the unit. This warranty is given in lieu of all other warranties, guarantees, and conditions on manufacturer’s part, and the manufacturer shall have no tortious or other liability in respect to this In-Line Duct FanTM. Ship unit to Suncourt Inc. only after obtaining a Return Goods Authorization (RGA) number. Returns without this RGA number will not be accepted. Actual product appearance may differ from illustrations. Suncourt reserves the right to modify any or all of its products features, designs, components and specifications without notice.